Fullmetal Alchemist is among the more popular Japanese manga series in modern times, with its entire series run written and illustrated by Hiromu Arakawa and initially published by Monthly Shōnen Gangan magazine (in serialized installments between August 2001 and June 2010) - before all the chapters were subsequently collected and republished in twenty-seven tankōbon volumes. The original manga, centering around the exploits of two brothers in a European Industrial Revolution landscape wherein alchemy has become one of the most advanced fields of scientific research and prowess , has sold roughly 64 million volumes around the world and has spawned its own anime series (directed by Seiji Mizushima) that aired from 2003-2004. Like the source material for next year's live-action Ghost in the Shell movie, Arakawa's Fullmetal Alchemist is a Japanese manga property with its very own built-in fan base that would more likely than not be willing to hedge their bets and see a live-action, feature-length adaptation of the property. As fate would have it, the first teaser trailer for such a live-action Fullmetal Alchemist movie is now online. In the footage featured above, distributor Warner Bros. Pictures teases potential viewers with a thrilling adaptation of Arakawa's original manga series that seems primed to offer longtime fans of the Fullmetal Alchemist franchise a thrilling live-action take on the original narrative and characters. 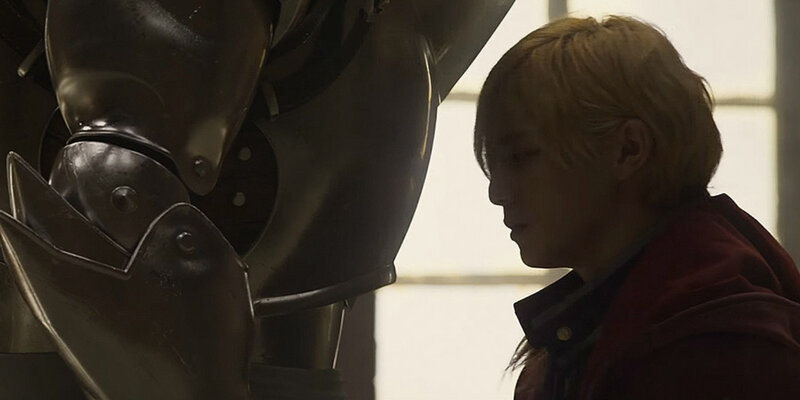 Teasing viewers with a few scant shots of some of the alchemy and fantasy elements soon to unfold within the film proper, potential viewers can begin speculating as to whether or not this Fullmetal Alchemist movie directed by Fumihiko Sori will be capable of winning their affections. Ahead of the theatrical release of Ghost in the Shell from director Rupert Sanders, a lot of manga and anime fans have already given the production flack for not casting an Asian actor in the lead role, and instead opting for the well-known American talent Scarlett Johansson to play Major Kusanagi. Comparatively, opting for a Japanese director to lead the charge in the making of a live-action adaptation of Fullmetal Alchemist might result in a little less backlash and a more culturally respectful production overall. It remains to be seen how general audiences will ultimately respond to the live-action Fullmetal Alchemist movie when it finally sees theatrical release. But based on the brief glimpses of footage offered by way of the official teaser trailer alone, Sori looks to have control of the production in a way that should honor manga creator Hiromu Arakawa's original series in spades. The Fullmetal Alchemist movie opens in Japan in 2017. It does not currently have a U.S. theatrical release date.